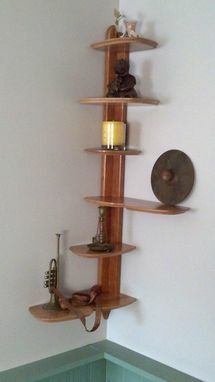 Our client wanted a special shelf to display mementos of world travels. The difficulty was in making some of the shelves work for taller items that would not fit if all the shelves were spaced at even intervals. We came up with a rather whimsical "cloud" design that made a couple of the shelves longer and therefore provide these spots for tall objects. Made from solid cherry (vertical member) and quarter-sawn sycamore which has a very distinctive grain pattern while contrasting nicely with the cherry. Shelves were kept thin to reduce weight and profile to make the focus the items, not the shelf.